Several heads of state, heads of international organisations, leading development advocates and other eminent persons are set to attend and address the Global Citizen Festival: Mandela 100 on December 2 in Johannesburg, South Africa, International advocacy organization Global Citizen has announced today. And a mouthwatering lineup comprising some of the world’s biggest musical stars will headline the first Global Citizen Festival to be held in Africa, at the FNB Stadium in Johannesburg. The heads of state that have confirmed attendance include President Paul Kagame of Rwanda, chairperson of the African Union; President Uhuru Kenyatta of Kenya; South African President Cyril Ramaphosa; President Nana Akufo-Addo of Ghana; Prime Minister Erna Solberg of Norway and President Mokgweetsi Masisi of Botswana. The confirmed eminent persons and leading global development advocates to address the Global Citizen Festival: Mandela 100 includes, Amina J. Mohammed, Deputy Secretary-General of the United Nations; Graça Machel, UN Sustainable Development Goals Advocate; Patricia Scotland QC, Secretary-General of the Commonwealth; Dr. Jim Kim, President of the World Bank; His Excellency Benedict Bengioushuye Ayade, Governor of Cross River State, Nigeria; Phumzile Mlambo-Ngcuka, United Nations Under-Secretary General and Executive Director of UN Women; and Ambassador Deborah Birx, U.S. Global AIDS Coordinator & U.S. Special Representative for Global Health. But Vice President of Zambia, Inonge Wina, who has been called upon by Global Citizen, to announce an additional investment of US$25 million per year towards nutrition at the festival, has not confirmed attendance. Currently, 40 out of 100 children under the age of five in Zambia are stunted and at risk of cognitive and physical limitations that can last a lifetime. Global Citizens have taken an unprecedented number of actions to apply pressure on world leaders to make commitments at the Festival around the issues associated with extreme poverty; gender equality, food security, education, the environment, and global health. World leaders, NGOs and leading corporations will announce major commitments at Mandela 100 in response to the calls of Global Citizen. Nelson Mandela’s widow Graça Machel and Prime Minister Erna Solberg of Norway will showcase the leadership of South Africa in the fight against HIV, in support of the Global Fund’s 6th Replenishment in 2019 at which it hopes to raise billions more in funding from the international community to continue this fight. Governor Ayade will declare that Nigeria will achieve open defecation free status in Cross River State, home to some 3.7 million people. If successful, it will be the first of Nigeria’s 36 states to become open defecation free. • LIFE BELOW WATER (Global Goal 14): addressing the threat plastic pollution poses to the oceans. “Nelson Mandela inspired us all to use our voices and actions to eradicate poverty. Each one of us can take small, impactful steps towards the great goal of ensuring every person lives in dignity, peace, and equality. I am proud to join Global Citizen in celebrating Madiba’s legacy and urging young people to be the generation to end extreme poverty in our lifetime.” said Graça Machel, Founder and Chairperson, The Graça Machel Trust. “With sagacity to match his humility, Nelson Mandela observed, ‘The anchor of all my dreams is the collective wisdom of mankind as a whole.’ Collective wisdom is our greatest Commonwealth asset, we draw insights from many traditions and streams of thought. Madiba taught us that it is possible to acquire and apply such wisdom ever more deeply for the good of all humanity in whatever setting we find ourselves – from prison cell to presidential palace. His example as a great son of Africa and of the Commonwealth continues to inspire our collaboration as we work towards a common future.” said The Rt Hon Patricia Scotland QC, Secretary-General of the Commonwealth. “Open defecation for us in Cross River State is a thing that we find unacceptable, especially in the urban centers because of the close accommodation. And so It is my strong pleasure that I will be personally there to speak strongly for Africa. And to speak on that international platform…whoever will be there on that day will hear the African voices.” said His Excellency Benedict Bengioushuye Ayade, Governor of Cross River State, Nigeria. “We are at an unprecedented moment in the HIV/AIDS pandemic. For the first time in modern history, we have the opportunity to actually control the global pandemic without a vaccine or a cure, and this is a very exciting time for us. Together with our partners, the U.S. President’s Emergency Plan for AIDS Relief (PEPFAR) is transforming the impossible into the possible by rapidly accelerating access to lifesaving HIV prevention and treatment services.” said Ambassador Deborah L. Birx, U.S. Global AIDS Coordinator & U.S. Special Representative for Global Health Diplomacy. 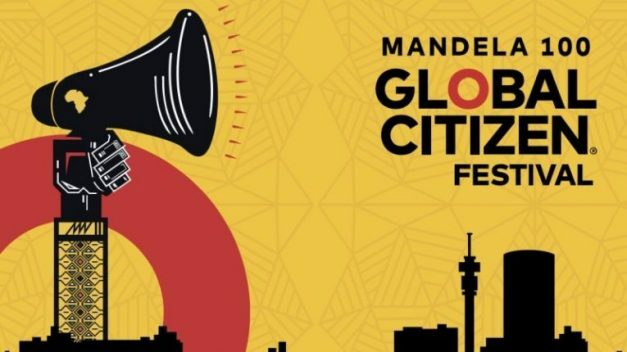 Beyoncé & JAY-Z, Cassper Nyovest, D’banj, Ed Sheeran, Eddie Vedder, Femi Kuti, Kacey Musgraves, Pharrell Williams & Chris Martin, Sho Madjozi, Tiwa Savage, Usher, and Wizkid will headline the first Global Citizen Festival to be held in Africa. Trevor Noah will host the Festival with co-hosts Naomi Campbell, Dave Chappelle, Sir Bob Geldof,Gayle King, Bonang Matheba, Nomzamo Mbatha, and Tyler Perry. The Global Citizen Festival: Mandela 100 will be presented and hosted by The Motsepe Foundation, with major partners, Johnson & Johnson, Cisco, Nedbank, Vodacom, Coca Cola SA, Big Concerts, Harmony, House of Mandela, Bill & Melinda Gates Foundation Goalkeepers, Eldridge Industries, and Associate Partners, HP, Microsoft and Tsogo Sun.